After having a baby, moms are usually left with some pregnancy scars and frantically, a fat belly. More than that, seeing celebrity icons appear to have their pre-pregnancy body back quickly and effortlessly give rise to societal pressure among moms. 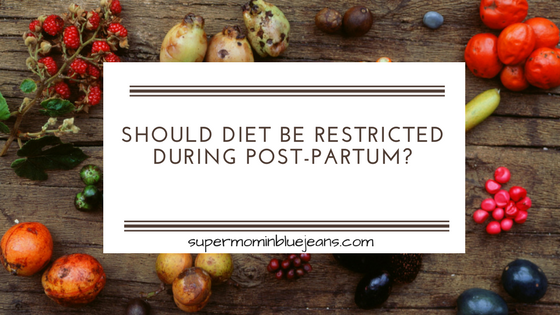 But the question really is, should diet be restricted during the post-pregnancy period? I will be providing a diet plan after pregnancy for moms at the end of this post but before that let us know what is the best and healthy ways moms can do generally after giving birth. Returning to pre-pregnancy weight has been a common interest among women. With a healthy diet and exercise, the excess weight can be shed off naturally. The goal should always be gradual weight loss with consideration to some factors like breastfeeding or formula-feeding and weaning. The safe weight loss per month shouldn’t be more than 4.5 pounds while the daily total calories shouldn’t fall below 1,800 calories. The daily caloric requirement usually needs to be revised upward on the basis of considerations of breastfeeding, nutritional status and overall level of activity. Inadequate caloric intake results in pregnancy fatigue and negative effect on mood, especially for lactating mothers. Post-pregnancy dieting may be accompanied by a significant decrease in bone mineral density because the diet may be lacking some vitamins and minerals. Talk with your doctor first before taking any supplements like if you need calcium supplements, iron supplements, etc. For lactating women, an additional of 300-400 calories should be added to your daily calories, as you have to keep in mind that you are eating still for two even after pregnancy. In fact, nutritional foods and exercise, and eating to satisfy hunger will generally result in the desired slow pattern of weight loss. Exercise during post-partum will promote healing and support emotional well-being. According to research, exercise also increases lactic acid levels in breast milk without any effect on infant’s acceptance of breastmilk one hour after exercise thus reducing the discomfort of engorged breasts. The appropriate exercise level will depend on postpartum recovery. Moms may be able to engage in fitness exercises within days of delivery while others may need to wait four to six weeks. • 1 cup 100% fruit juice. • ½ cup cooked rice, pasta, or cereal. • ½ ounce nuts or seeds. To top it all, don’t engage to crash or any fad diets, where you lose weight quickly, either during pregnancy or breastfeeding. These diets don’t have a good balance of important nutrients needed for both you and your baby. Thanks for reading my post and feel free to message me if you have nutrition and diet concerns or feel free to leave your comments below. Great article. As a mother of a 2 year old, and another on the way, this is something I’ve been through before and will be there again before I know it! There is a lot of societal pressure to get back to pre-pregnancy weight, however, I definitely agree that it should be done the right way. Thanks for reading my post. And congratulations for your new bundle of joy! Wishing you all the best and thanks for dropping by! This was one of the best websites I have viewed. I love that you used a blue jean texture design on the borders. The diets and other information are GREAT. Over all, I think your website is going to be very successful. Thanks so much for dropping by. Wishing you all the best as well.